Other Products by Balance Sports Nutrition. Search other Amino Acids products. Balance Intramino delivers a high dose Branched Chain Amino (BCAA) supplement in the scientifically proven 2:1:1 ratio (Leucine:Isoleucine:Valine) to support lean muscle gains. 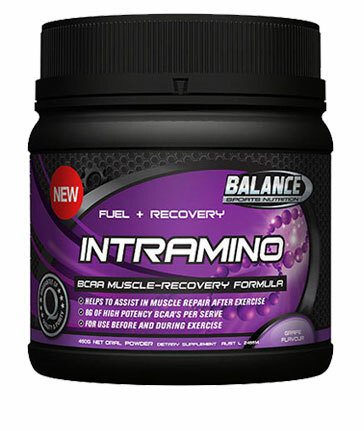 Balance Intramino also contains Glutamine the "anticatablic nutrient" to aid recovery and prevent muscle catabolism. The addition of magnesium necessary for optimal muscle function and to inhibit cramping along with nutritonal vitamins to support the immune system and recovery ensures Balance Intramino has covered all bases when in comes to muscle growth, maintenance and repair. Mix 1/3 scoop (15g) in 400ml cold water and use before, during or after training. Ingredients: Leucine, Glutamine, Isoleucine, Valine, Maltodextrin, Citric Acid, Beet Red, Watermelon Flavour, Sucralose, Silicon Dioxide, Lecithin, Calcium Pantothenate, Thiamine Nitrate, Pyridoxine Hydrochloride, Riboflavin, Nicotinamide, Cellulose Microcrystalline, Ethylcellulose, Cyanocobalamin.